blue – Is A Fish A Man ? After a tortuous journey to Heathrow Airport (everything that could go wrong did) it was such a relief to be on the aeroplane that i barely noticed it taking off. The meal was the usual Turkish-Cuisine-As-Recreated-By-A-Race-Of-Androids but airline food has its own particular magic. Perhaps it lies simply in the wonder of the fact that we are eating in the sky or perhaps it’s down to the mysterious allure of the little tin foil covered plastic pots in which it’s served. Four hours or so later and we were there – well, theoretically; but of course there was the ordeal that is Atatürk Airport to negotiate first. Once again i managed to choose the queue containing the dreaded Person-With-A-Problem-With-Their-Passport, although thankfully whatever the problem was it was soon resolved. Grabbing my luggage (yes, it was there!) i made my way to the Metro Station, trusting (hoping?) that i would instinctively remember how to get to Sultanahmet. Half way there though it dawned on me that it would be better to change at a station called Zeytinburnu rather than the one i’d changed when i’d come last year. Near miss number one: i almost got on a train going the wrong way. Thankfully, two Turkish men guessed where i was going (to the area where all the foreigners go!) and guided me to the right platform. I found the hotel itself without too much trouble. It was more upmarket than the hostel i’d stayed at the year before but less friendly. I guess you can’t have it all. Awoke and realised i was in Turkey! After breakfast (this was the only day i managed to beat the Germans to the buffet) i first had to recharge my phone. Bizarrely my room had no power outlet so i had to sit in the main reception area and wait. As soon as it was done, i set out to reorient myself. I walked down towards Eminönü, following the tram line, and crossed Galata Bridge. It was a lot colder than when i’d been in the city the year before. 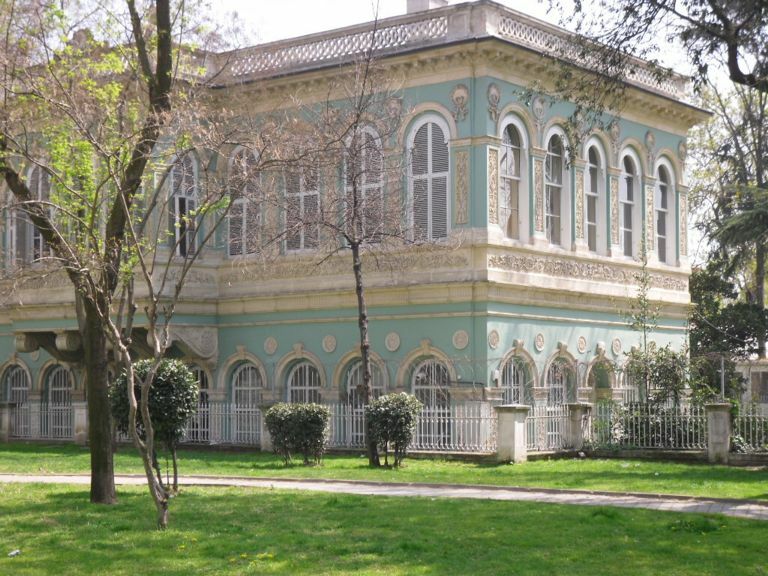 I made my way to Beyoğlu and withdrew some cash – i’d brought only 25 TL with me. Then, after a stop at a cafe i set off to look for the Istanbul Museum of Modern Art. What a mission it turned out to be! I found my way down to the main road along the Bosphorus without problem but then couldn’t locate the Museum. Where the map seemed to be saying it should be there was nothing. An old Turkish man insisted it was inside the university building a bit further on. This seemed doubtful but i went there anyway. The security guards (Turkish universities are obviously tough places!) looked at my guidebook and shook their heads, pointing further along the road. Finally i found it the Museum. I was relieved but also, irrationally, angry. I felt somehow as if someone had been playing a game with me. Inside it was – truth be told – very much like modern art museums the world over: all white walls and glass. Most of the paintings on the main floor did little for me, although i did marvel at the pretentiousness with which they were described. Downstairs however i found the work of Erol Akyavaş* (1932-1999). His work fuses Islamic calligraphy with modern art and is stunning. The one i found most interesting seemed to incorporate views of a wall. The paintings of Bedri Rahmi Eyüboğlu were also interesting; he used lots of brown and the finished works often resembled calligraphy (in case it isn’t obvious by now: i love calligraphy). Finally, in an exhibition of photography i found a fantastic and grotestque (or fantastically grotesque if you like) panel of photographs by a Russian photographer called Petr Lovigin: masks, wheelchairs, cows, sheep, kites and fishing rods. When the Museum closed i made my way back up to Beyoğlu to meet my friend Ö. We met last year when i was walking in the south of Turkey and apart from a brief email exchange we’d had no contact since so i was a bit nervous. Would we even recognise one another? In fact, i did recognise him but i was astounded to see how different he looked in his business suit. Somehow it was as though i’d expected him to show up in the shorts and t-shirt he’d been wearing when i’d last seen him. He led me through a maze of back streets to a small cafe where we ate and then we walked about the city chatting. We finally parted company at eleven o’clock. He had a two hour journey back home, which he’d have to repeat the next morning to get to work. Finally BF Day had dawned – the day on which i was finally to meet my my internet buddies, B and F. After breakfast i took up my post outside the hotel wondering how i would recognise B when she arrived and how she would recognise me. Soon a beautiful lady in a bright pink coat appeared. Instinctively i thought to myself: “This is her”, but as my instincts are far from infallible and i had no idea how i would extricate myself from the situation if she turned out to be some random Turkish woman (who in accordance with the Law of Sod would of course not be able to speak English) i stayed where i was – even when she started looking about uncertainly. Sultanahmet is Tourist Central; Turks rarely seem to venture to the district unless they work there, but still… maybe she was here to meet someone else. I briefly imagined hordes of British tourists all meeting up with internet buddies for the first time. Only when i saw her dial a number and heard my mobile ring in my pocket did i know i was right: this was B. She too had guessed i was the person she was looking for but like me wasn’t quite confident enough to take the plunge and approach me. When my phone started to ring she rushed forward to greet me. It was an amazing moment, meeting after a year’s correspondence. F was going to be late because at the last minute someone had called and asked him to write out 200 wedding invitations (apparently his calligraphic skill is legendary amongst his friends). In the meantime – after buying my train ticket to Thessaloniki – B and I repaired to a cafe near the Haghia Sophia where we chatted over tea warmed by a heater which one of the waiters pulled up close to us. Predictably her English was much better than she’d suggested; it only made me feel worse about my lack of Turkish. She gave me a CD by a musician called Stephan Micus as a present. I’ll have to wait till i get home to listen to it though. When F appeared we drank more tea (my kind of country!) 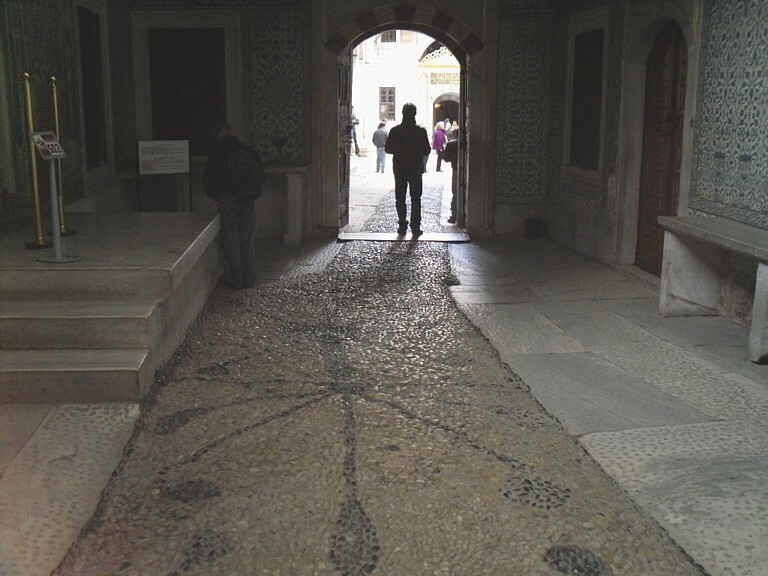 and then headed over to the Topkapı Palace Museum to check out some Ottoman history. 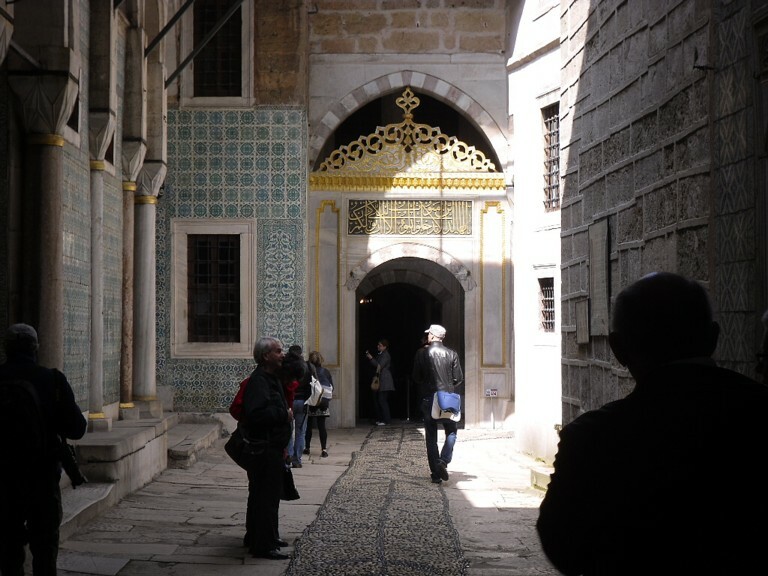 The most interesting part of the museum was the harem – not the steamy sauna of Western imagination, but instead the living quarters of the Sultan and his family. 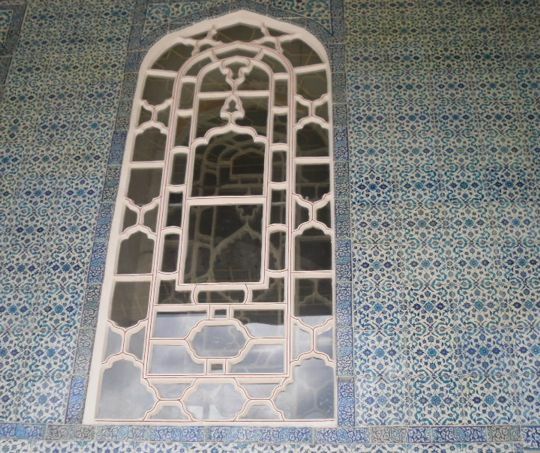 The tiles which decorate the walls are pretty spectacular: shades of blue, turquoise and red in flower-like patterns. F told me that the tiles are extremely expensive to make; enough for a wall would cost thousands and thousands of pounds. The red dye is especially costly. As F pointed out it, it stands out from the rest of the tile; if you run your hand over the top, you can feel the bumps it creates. I preferred the turquoise colour though. Most of the rest of the afternoon was spent in cafes: eating, drinking and chatting. Eventually B had to leave us (sadly). F and I took the tramway and funicular railway to Beyoğlu, where he showed me the best places to buy English language books. I found a book called Living Poets of Turkey, which has some excellent poems in it and a collection of Nazim Hikmet‘s poetry in English translation. F also pointed out some novels to me. I hope to go back to the shop to buy them when i return to Istanbul at the end of my trip; i didn’t want to carry them across Greece**. Later we went to a restaurant where we talked about everything under the sun (he is one of the rare people on this earth who can talk as much as me!) till it dawned on us that we were the last people left in the building and that the staff were waiting to close up. All in all, a great day! * Unfortunately, i was unable to find a link to a page with a good selection of his artwork. This one at least has plenty of information about the artist himself. ** As it was, i had to leave the book of engravings and photographs that F gave me as a present with the staff at the hotel in Istanbul. I have to hope they’ll hand it over when i return! We never really look at those we know and love, yet will gaze at other passengers on a train noticing all their little details. Take this carriage and the people sitting facing me. One woman has black-painted nails gnawed down to the quick. The man next to her – pink shirt, tiny cut on his throat where he presumably nicked himself while shaving – is beginning to lose his hair. It’s fine and blond, and a bit tousled. Perhaps he overslept? Had to get ready in a hurry? That would explain the cut too. And so it goes on. I notice their clothes, their lips, the length and shape of their fingers (as they fidget, write a text, turn the pages of their book). I wonder where they’re going. All but two of the people are blue-eyed. The exceptions are both girls: they’re sitting together but I don’t think they know one another. The one nearest me has brown eyes – in fact they’re almost black – while her neighbour’s are green (i think). She has turned her face away and is staring into space. ‘What is she thinking about?’ I wonder. The first line from a poem called Opened by Mario Petrucci, from his wonderful collection Flowers of Sulphur*. The poem is about a funeral but for some reason this sent my mind off in a completely different direction: to days out at the seaside – Rhyl or Prestatyn – as a child. Whatever the weather when we left home, whatever the weather when we arrived at the coast, you could almost guarantee that at some point during the day it would turn, and we would have to seek refuge from the inevitable wind and rain. You would find us crouched beneath the sea wall, invisible beneath our cagoules. My dad would be pouring milky coffee from his flask (nobody was allowed to handle the thermos except him) and my mum would be doling out butties – cheese or jam or fish paste. These would quickly acquire a coating of fine sand but that didn’t stop us eating them. In fact, the quicker you ate them the better as Sally would have them off you in a second if you put them down. She would also have your Penguin biscuit**, although you’d get in trouble if she did because dogs and chocolate don’t go. Still we’d hesitate when it came to take it, trying to decide which colour wrapper to select. This was despite the fact that we knew full well that the biscuits inside were all exactly the same. Nevertheless: Red? Blue? Green? Sally, being a dog, was the only one of us who didn’t have a cagoule, so my dad used to open up his and wrap it around both of them. For the rest of the family this was an impossibility as we had those old-style cagoules*** you have to put on over your head like a smock. No breathable linings in those days: you got wet from the rain or wet from your sweat. Your choice. This is how I always picture us on those family days out: a tribe of blue and red plastic ghosts. This is the image i somehow associated with the line from Mario Petrucci’s poem (have i mentioned how good it is?). The sunshine – when we had any, the sea and the sand are much more vaguely remembered. But this is not, I think, down to negativity on my part. No, I cherish that image of us huddled together in our cagoules. It is the very essence of family. Of course, it was also the performance of family – because we were in public after all, even if there were only seagulls to view us; and so in some ways it was as much about the family we wanted to be as the family we were. But perhaps that’s also part of what a family is in any case? Aspirations and memories and food and shelter. * ISBN: 978-1904634379, published by Enitharmon Press. See here for a review. ** Ignore the photo. It shows the modern day wrapper. Google couldn’t locate any pictures of the coloured tin-foil packaging the biscuits came in during the 70s. You will have to use your imagination/consult your memory. ***See the section on the roll-up-able cagoule on Wikipedia’s page about cagoules. I don’t remember ours being roll-up-able though. It’s really only been two months since i started to blog and for most of that time i feel i’ve been struggling to find my feet. At the beginning i was crippled by self-consciousness and the realisation of how rusty i’d become as a writer: it had been such a long time. Now i’m starting to relax. I’ve accepted that i’m never going to win any prizes for style or content and am just enjoying the freedom and – paradoxically – the discipline of composing a post: the spark of the initial thought, the battle to shape it into coherence and the endless re-reading and editing as i try to make it express what i want to say. Today i felt the urge to look back at my “blue book”, a journal i kept intermittently between 2001 and 2003. I suppose i wanted to see how i’d written then – i was curious for example as to whether typing your thoughts out would tend to produce a different kind of flow than writing them out longhand. There were also a couple of entries that i remembered and wanted to re-read again, because they cover moments in my life that matter to me. One of them in particular almost makes me cry when i read it: it’s about the birth of my son. He wasn’t born during that period, some ten or twelve years before in fact, but it was a day in 2001 when i sat down and wrote really openly and honestly about his birth and what it had meant to me. As i read the entry through i realised that i could never write anything like that in my blog. It’s not a question of self-consciousness so much as of the privacy of the other people involved. Even with the posts i do write i occasionally find i need to mention other people and i struggle to do it in a way which protects their identities. That is the difference with a journal: it’s a private space. I always think of those schoolgirl diaries with the little lock and key. A blog by contrast is inherently public – i know you can lock down specific posts but somehow that seems to defeat the object of blogging. You gain something through the act of putting your words up here on the Web: the magic of seeing them separate from you – for many of us the closest we’ll ever come to being a published writer – and the excitement of the idea that someone else will read them. We all hope and fear that. But you lose something too of course, another freedom. I was sitting on the train today feeling very annoyed with myself for my low mood. I cast about in my mind for something to kick me out of my eeyority and up came my very best memory: the day of the blue sky. I sat there feeling sad about all the people who had never lived to see that sky or who hadn’t yet been born or who were somewhere else in the world where that sky wasn’t visible. ‘If i hadn’t been here right now,’ i marvelled, ‘I wouldn’t have seen it either.’ Many times since then i have returned in my mind to that hill and that sky, keeping the memory alive with my visits. It was only today though that i suddenly connected it with another memory from earlier the same year: the day of my tenth birthday, when I woke up elated to finally be in double figures. This was what separated the kids from the grown ups in my mind. I’d finally made it! Yet no sooner did i experience this wave of joy at my new found ‘maturity’ than it was overtaken by another wave, this time of sadness. Because at that moment i realised that once you leave single figures there is no way back. Time moves in one direction only and takes you with it. For the first time in my life i had the sense of things being lost, of leaving bits of your life behind forever. I noticed for the first time the way that time seems to speed up with each passing year and i was frightened. By contrast, just two years earlier at the age of eight, i’d walked past a group of Fifth Years as they poured out of the local high school and thought to myself in despair: ‘I’ll never live long enough to be sixteen!’ Not because i thought i was in imminent danger of death, but because to me at that point in my life, time was something that seemed immensely slow moving. It had taken so long to get to the age of eight, i couldn’t imagine accumulating enough life to reach an age which was double that. As for memories, i didn’t worry about losing them because i was barely aware of having them. In just two years i’d made the transition from a creature of the present to a person with a past, one that i was already aware was vanishing. And so on that hill i tried to fix a moment forever. In a way i succeeded, in a way i failed. I remember the moment: the intensity of feeling. I even remember the hill and the river. But the blue sky? Today i realised it was gone.